The weather deteriorated on Saturday night so that by Sunday morning, we woke to driving rain, much to the cats' disgust. Missy (being an extreme weather cat of some standing) sprinted out of the door, heading for the bottom of the garden at speed... Charlie went back to bed. Things did improve by early afternoon and Dave spent a few hours out in the garden, digging things up, cutting things down and planting some sticks. The sticks were in fact a lucky find, in the form of heavily pruned redcurrent, blackcurrent, gooseberry and raspberry bushes spotted in the Poundshop in town, next to the halloween props (which we'd gone in to look at). Given our repeated dismal failure to grow anything of worth in our garden, bets are now being taken on whether they'll survive until spring let along fruit! While Dave was getting creative in the garden, I got out my spinning wheel again for an hour or two. I haven't touched the wheel since last weekend, so it was a pleasant surprise to discover that in that time, I seem to have finally got the hang of it! I'm still concentrating on drafting and I'm happy to report that things were a lot easier yesterday. I'm still not producing a single of consistant thickness, but... the panic is gone. I seem to have loosened up and relaxed a whole lot which meant I could hold the fibrestore loosely enough to draw fibres from it. I even seem to be able to stop and start the wheel without everything going to pot and I managed to walk the single up and down the hooks on the flyer the way you're supposed to, producing a much neater looking bobbin. In short, after a tense first five minutes, I was actually enjoying myself, which can only be a good thing. I'm also thinking about how to improvise a lazy kate, which I think I'm going to need soon as I prepare to tackle the heady heights of spinning, known as plying. No photographs this time as the light was awful and I'm not sure that another bobbin shot would show much. I do however have another finished project - hurrah! I finally cast off the preemie blanket I started for jury service back in July. 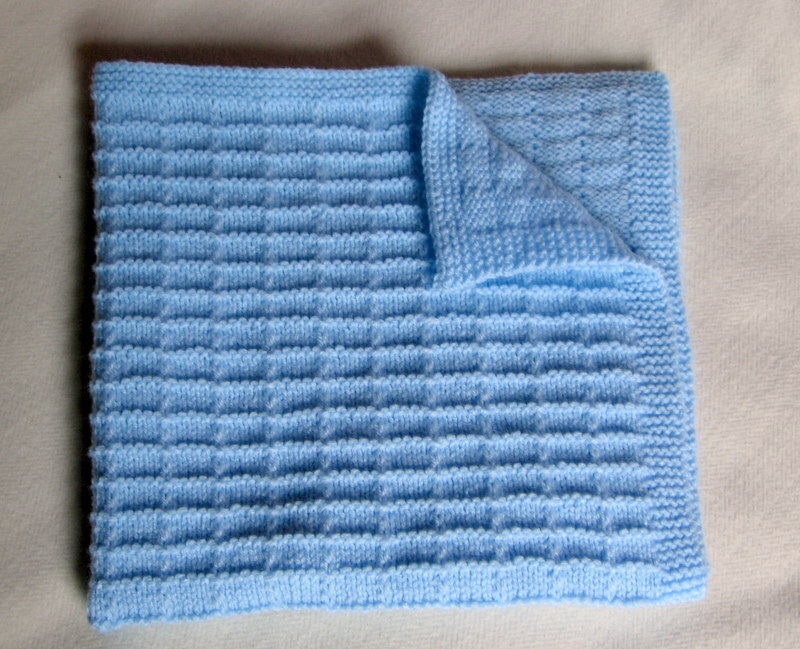 This is a waffle stitch blanket, pattern here, although to be honest the pattern wasn't much help. The stitch count and instructions don't really cut it as the maths is completely wrong. If you do want to make this blanket, the stitch count should work out to 15 + a multiple of 6. 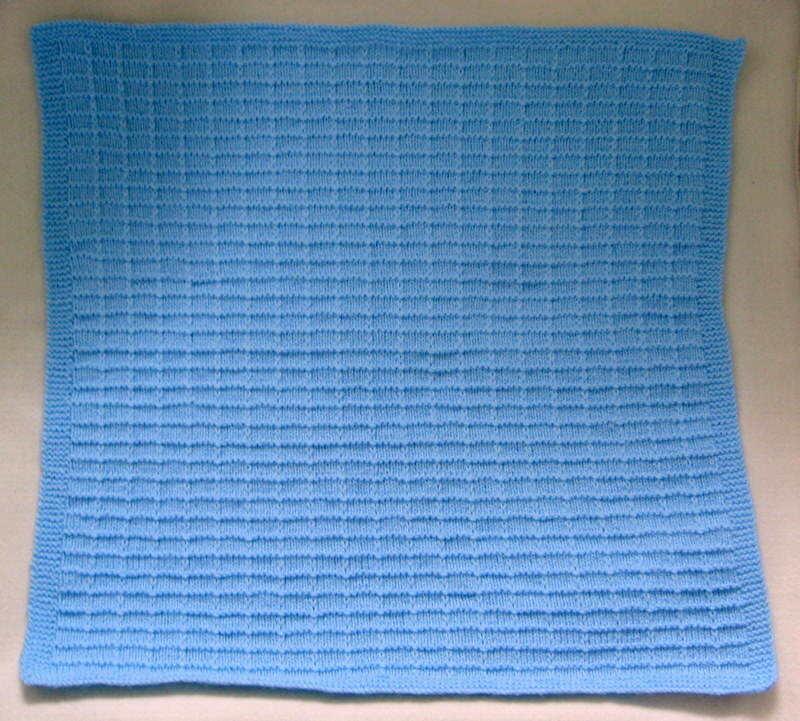 In my case, I made a largish blanket but kept it within the guidelines for blanket size for SCBU cribs, so it's 60cm square based on 135 stitches. I like the blanket and the way it turned out, but I learnt a valuable lesson from this one. A knitted blanket, even if made for the tiniest of recipients is a major undertaking and will take a long time... This compares to all other blankets I've ever made which were crocheted and just seem to grow an awful lot faster rather than sitting there being knit on but never going anywhere for weeks on end. Not to say I'd never knit another blanket of course, just next time I need to remember how long it will take a slow, tight knitter like me! You just need sunlight and manure to grow in garden not something you don't know, still its a nice tree blocking the sunlight much appreciated by your cats. Nice to here you got your knack with the spinning wheel. Yup, the only blankets I have knitted on, have been made out of squares and worked over months/years. Even the Lizard Ridge one took some 6 months by machine! Crochet is the way to go, especially if you pick an interesting pattern. I still do knit baby blankets, but only on the Passap, which has an electric motor, and I can let it get on with it!